Business intelligence for airlines and hotels has transformed the hospitality industry by opening the door to predictive analytics and streamlining general processes for overall efficiency. Hospitality organizations have increased their adoption of analytics to establish and predict customer behavior in order to personalize services, optimize price strategies, improve marketing campaigns, recommend further products and services, and for overall yield management. 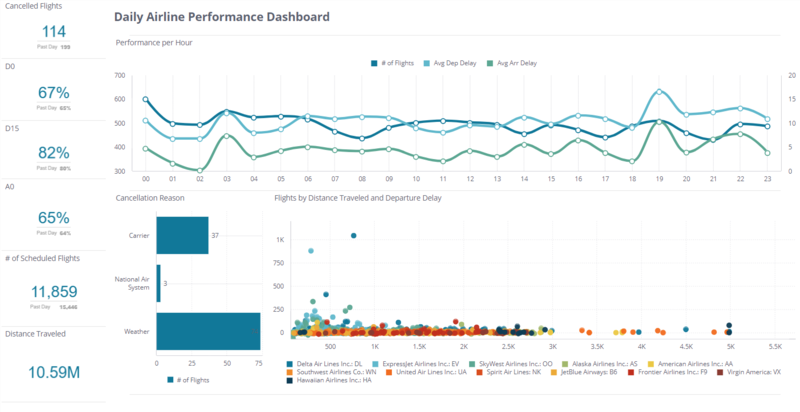 Airline business intelligence is useful for integrating different datasets including weather reports to make predictions about flight setbacks and cancellations, while business intelligence for hotels includes the ability to visualize customer behavior as a whole to gain insights into what works and what doesn’t and to establish what can be expected from specific customers. There are many different datasets that go into a well-run hospitality entity, using an analytics solution that can integrate everything from property management systems, to sales databases, to reservation systems, to food service data, to employee management, allows a business to increase sales and reduce operating costs by pinpointing problem areas, and streamlines all data into one source. Data relating to hospitality can come in many forms, and be useful in different ways from the perspective of business intelligence. Hotel and airline industry personnel can benefit greatly from a system that handles big data quickly and effectively. Having a standardized way of recording and storing information means integrating all data into one pool that can be manipulated and queried to identify problems, find patterns, and predict new outcomes. In order for big data to be useful, a BI tool must be updated regularly with fresh data to keep relevant, and it must contain enough data to extract actionable BI insights. Large data pools can be drilled down to granular data points to get a more realistic view of what is happening which then provides ways to improve performance by cutting costs, increasing revenue, or highlighting new business avenues. Hospitality enterprises need to keep abreast of varying information coming from multiple sources at all times which requires a platform that can handle big data in a highly organized and intuitive way. The first concern for airline analytics and hotel BI analysts is to have a system that can assimilate large and disparate datasets into one place to form a single version of truth that can then be investigated and broken down to extract useful insights. It should update regularly and automatically to standardize how data is recorded and to keep the insights and reporting current and relevant. In order to be useful, a unified data pool requires the ability for manipulation, querying, and to be organized effectively for drilling down to individual data points. One of the most vital points of consideration is having a hotel or airline BI tool that can be used by non-IT personnel. The necessity for constant IT involvement in building and maintaining BI dashboards means significantly more time for every action that must be carried out, and the inability for immediate self-reporting by individual departments in an organization. Last, a good hospitality analytics platform should be secure to keep customer information private at all times. Sisense developed a BI platform that can deal with large and varied datasets without the use of expensive hardware or the need for added data warehousing. Being in the web means the system is infinitely scalable with extreme flexibility while still allowing for the smallest of data points to be drilled down and examined. The ability for quick as-needed refreshes allows users to have access to the most up-to-date data so that insights and reporting are never stale. Sisense also built the platform to be used by non-IT personnel, with an ElastiCube technology which enables building and reporting by individual departments in a hospitality organization, while freeing up IT to handle other issues and cutting the overall time needed for dashboard implementation and general reporting. Plus, Live Data Models can be built through the Sisense hybrid model using either SQL Server or Amazon Redshift which can be used as a comparison against historical data to find trends and patterns not otherwise seen. And, of course, the entire platform was built with security in mind to ensure that all company and client information remains private and safe.